I was horrified the other day to read that someone wants to pull the active rails downtown and turn them into a trail! I immediately thought, "You don't want to give away the one big advantage that you have." Actually, that was my second thought. The first will remain unsaid. Anderson has a unique advantage in that we have active rail lines here. This can work for us in two ways. The first is attracting industry and business that need rail service. Two recent examples are the plastics plant now in the old Magnaquench plant on Scatterfield Road and the wood processing company that has moved into one of the old Guide plants. Because the railroad is here, we have these companies, and more will come. Space that is now unused can be utilized with the addition of a siding. This is not rocket science and only requires that we recognize what we have to offer. But that is not the prime advantage that we have with rail service when we look to the future. There are those who say that rail is a thing of the past. That is incorrect. More tonnage is moved by rail today than in the so-called peak years of WWII and the early 1950s. We move more with less. Trains are longer and heavier and every one that you see is just that many more trucks we don't have clogging the Interstate system. Rail service is not going away. Indeed, we will need it even more as gasoline price continue to rise. Lastly, and the reason for this letter is the other tremendous advantage we have looking to tomorrow. What is needed is not ripping up rails, but the formation of a Regional Rail Transportation Authority. If you drive to Indy during rush hours, you know exactly where I am going with this. Anderson is really in a great position for the resumption of rail passenger service in the form of commuter rail. We have a double track main line running from downtown Muncie, through downtown Anderson right on to Pendleton, Ingalls, Fortville, Lawrence and Indianapolis. What more could you ask for? 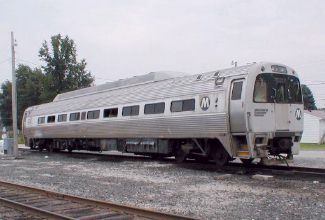 Each rail car can take 60 to 80 automobiles off of the highway with the additional savings of thousands of gallons of fuel. The Rail Authority comes into play with establishing the commuter rail and shuttle transportation at destinations. The talk has been of Noblesville to Indy, and that rail line exists to be used, but so does ours, and it is in fart better condition. You want to attract more people to Anderson and Madison County? Give them transportation to where they need to go for work, and play. Rail is not the past, it is our future! We once had hourly service from Anderson to Indy or Muncie from 5 AM to Midnight. We gave that away, but we don't have to make the same mistake again! We have the basic facilities in place and CSX already works with a number of Commuter services in the East. They can do it here as well. The Indianapolis Metropolitan area needs commuter rail and we can be positioned to take advantage of that need. We have the rail. We have the history. And we have the ability to be ready for future needs. Tomorrow will come whether we're ready or not, so, let's be ready by keeping our advantage in place. Metro North Commuter Railroad 292 in South Anderson Yard, August 2005 - Roger Hensley Photo.